The heat and dry conditions, which have claimed lives, fueled wildfires and dried up crops, are taking their toll on wildlife as well. From fish kills to dangerous encounters with humans, the animal world is suffering. The National Climatic Data Center reported Monday that the U.S. is in its worst drought since 1956. 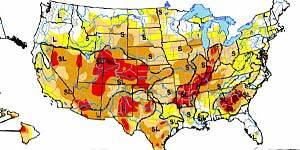 About 55 percent of the country is in moderate drought, while almost 75 percent is in some state of drought. The National Oceanic and Atmospheric Administration reports the past 12 months ending June 30 are the hottest ever on record. In the past half year, 28 states east of the Rocky Mountains set temperature records, and 170 all-time temperature records were set in June alone. The NCDC said the hardest hit areas are the Rockies through the Central Plains and the Ohio Valley. Hunters and anglers across the nation are asking on web sites and forums how this will affect their seasons. "Heat distresses wildlife, just like it distresses us," Dennis Figg, wildlife programs supervisor at the Missouri Conservation Department, told the Columbia Missourian. "We can expect wildlife to be just as stressed as people and plants are." Game and fish officials say most wildlife can survive the heat, but extreme drought conditions have made food sources scarce, sending animals on the move to forage. With berries and other edible plants in short supply in high altitudes, bears have been coming down to raid areas populated by humans. Efforts have been taken to educate campers and homeowners about how to prevent bear encounters, like making sure all food sources are secured away from the large omnivores’ tremendous sense of smell. After several attacks near Aspen, Colo., the U.S. Forest Service placed a temporary ban on tents and campers with fabric sides. Wyoming advised overnight visitors not to set up near water sources, allowing wildlife unabated access. In Arizona, which, prior to this summer, only had seven bear attacks since 1990, there have been three attacks in the past month, the latest being Sunday, USAToday reported. Arizona State University wildlife biology instructor Stan Cunningham said attacks there are rare but bears have become desperate during the drought, which the state has experienced in varying degrees for almost two decades. "It's hard being a bear in Arizona,” Cunningham told USAToday. "It’s pretty unusual. After 26 years of studying animals, I've figured out they do exactly what they want to do, and not what experts think they do." Mountain lions are also ranging outside their territories. In Tonto National Forest, one of the big cats injured a 2-year-old recently and another went after a pet goat as the owner watched in horror, the Arizona Republic reported. Deer also can be on the move during droughts, as they might travel long distances outside their normal times in search of food and water. In extreme heat, some might find a cool place and hunker down. "A lot of animals are going to seek refuge in places and lay low, and do that for as long as they can," Missouri’s Figg said. A number of states are reporting fish kills as water heats up and loses oxygen. In Wisconsin, tens of thousands of dead fish were found in the Rock River system. "They're dying from botulism and then decomposing," DNR district wildlife supervisor Eric Lobner told Newsradio 620 WTMJ. "As a result, waterfowl and shorebirds are also affected by the bacteria and dying. It can spread very rapidly." Arizona also has experienced a major fish kill due to high concentrations of golden algae on a 20-mile stretch of the Salt River, and experts believe there’s a connection to the toxic algae and the extended drought, the Daily Miner reported. There’s some good news along with the bad. Indiana’s Department of National Resources reports the drought is killing invasive Asian carp in the Wabash River. The fish congregate in backwater areas that are drying up. Similar congregations in pools have made for good fishing of desirable species, like catfish along the Mississippi River. On Lake Michigan, there's good fishing for steelhead as the fish gather near the shore, hesitant to swim into warmer-than-normal streams, the DNR also reported. Another effect of the drought is the lower number of insects that need shallow pools of temporary water to develop. However, this takes out a link of the food chain for birds and bats. The lack of bugs around Austin, Texas, has the area's huge bat population coming out earlier and feeding later in the mornings, NPR reports. "The drought is hammering Texas," Cindy Loeffler, the water resources branch chief at the Texas Parks and Wildlife Department, told NPR. "Usually we don't see impacts to fish and wildlife — they're adapted to hot, dry conditions in Texas. But this year, we're seeing impacts." NOAA forecasts are for above normal temperatures through July from Nevada to New York, while the Southwest is predicted to receive above normal precipitation in the Four Corners states and the Midwest is expected to see below normal precipitation, worsening conditions from Nebraska and Kansas to Indiana.